A selection of tasty new dishes have made their way onto the menu at PierSide Grill and Famous Blowfish Bar on Fort Myers Beach, bringing restaurant-goers an eye-catching and palate-pleasing dining experience. 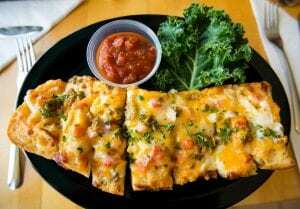 On top of its newest additions, the restaurant is also reintroducing a couple of well-known favorites. New appetizers on the menu include the Guacamole & Pico De Gallo, Chicken Satay and Guacamole Fritters. The Guacamole & Pico De Gallo showcases a flavorful combination of fresh diced tomato, chopped onion, cilantro and jalapeños, served with tortilla chips for $9. The Chicken Satay presents two charbroiled chicken skewers, delectably marinated and drizzled with peanut satay sauce for $10. The Guacamole Fritters feature PierSide’s hand-crafted guacamole, skillfully seasoned and rolled in panko, and served with a sweet chili Thai sauce for $11. PierSide is also bringing back two favorite appetizers, including the Conch Fritters, a Bahamas-style dish topped with fresh green pepper, pimento and spicy Cajun dipping sauce for $11, and the Fried Calamari, with hand-cut tubes and tentacles, lightly breaded and served with marinara for $11. 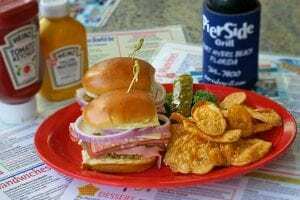 In addition to the array of appetizers now peppering the menu at PierSide Grill, the beachside restaurant is also introducing a new sandwich: the Italian Sliders, which features two soft potato rolls drizzled with herb olive oil pesto and piled high with select deli meats, provolone cheese and red onions for $12.